Can a countywide transit millage gain political support? From the beginning, it has been assumed that a Washtenaw County regional transit system would be financed in part by a countywide millage. Though the financial plan (big file) produced by AATA’s London (England) – based consultants suggested a number of other funding mechanisms, most of them seem impractical or outright impossible in any near term. One reason is that the Michigan Constitution, including the Headlee Amendment to the Constitution, prohibits most forms of taxation by local governments. 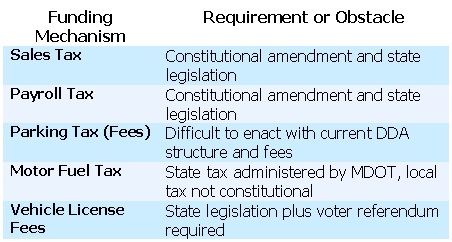 (See this summary of Michigan tax law; it has not been updated to reflect changes passed in 2011.) Thus, many of the taxes recommended by the TMP’s consultants are not feasible under current state law. Note that “fees” are permissible, but they cannot be levied without a commensurate benefit. As we reviewed in Taxes for Art, the Bolt Decision said that local governments cannot levy fees that do not meet certain criteria, including that the fee is regulatory (related to administration of the service, proportionate to the cost of providing the service, and voluntary (one may simply not use the service and avoid a fee). We calculated that assuming all communities (other than those which have currently opted out) do participate, a 1-mill property tax across the county would yield about $12 million per year, which could meet the budgetary requirements of the TMP in the first 5 years. In other words, property owners would pay $1 for every $1000 in taxable value on assessed property. Like all post-Headlee taxes in Michigan, this would require a vote of the people. The consultants also calculated the possible yield of a countywide millage; they estimated $14.5 million a year (their estimate assumed that the entire county would be contributing). It has been recognized since the early days of this proposal that a countywide vote could face political problems. A countywide survey conducted in October 2009 found that while 72% of people countywide liked the idea of an expanded transit system, only 51% said they would be willing to vote for a tax to pay for it; this was deemed by the survey takers to be a “soft” result because 34% of the respondents actually said they would “probably” vote for a tax. Countywide voter approval before December 31, 2014, of a New TA Act 196 funding source adequate to fund ongoing operations of New TA. This does not actually call for a property tax millage vote, and the advocates of the new authority might justifiably feel nervous about the political prospects for such a vote to succeed, based both on the survey results and on some understanding of county politics. One factor to consider whenever contemplating a millage issue for the ballot is whether competing millage issues are also planned. The presumption is that, especially for new millages (rather than a renewal), the public is less likely to vote for two millages at the same time, and will either reject one of them, or even both. With that in mind, it is notable, as reported by the Ann Arbor Chronicle, that the Board of Commissioners has been discussing a supplemental county millage for specific programs next year. The vote might occur at three possible times, not necessarily November. It was announced at a u196 meeting by Ypsilanti Mayor Paul Schreiber that the City of Ypsilanti is considering both an income tax measure and a bond issue vote for the August 2012 election. While these are not millage votes, they could color voters’ perceptions of a new millage. Another factor in passing millage issues is voter turnout. In general, higher turnouts do not favor new tax measures, since the first reaction of uninformed voters is to vote “no”. November 2012 is a Presidential election and can be expected to have a high turnout of occasional voters. There is a rumor (unconfirmed) that there may be a marijuana legalization referendum on the Michigan statewide ballot. Such wild cards can influence the makeup of the electorate. But the key factor in a countywide millage vote is likely to be resistance to taxes in general, flavored by a strong suspicion of anything originating in Ann Arbor. The municipalities across the county, especially individual townships, vary widely in both the amount they are willing to tax themselves and in their attitudes toward government in general. Some of the rural townships’ residents are happy to live at a much lower level of amenities in exchange for a low tax rate and less interference from government. They don’t call it “Freedom” Township for no reason. Many townships in the county keep their operating millage around 1 mill total. As shown in a table extracted from the County Apportionment Report, many have an operating millage lower than 1 mill, though some have also voted in supplementary dedicated millages, for example, for fire or police protection. Compare these rates with those levied in more urbanized areas, including both the cities of Ann Arbor and Ypsilanti. Pittsfield and Northfield townships both support their own police forces, and Ypsilanti Township has multiple dedicated millages, including for police and fire protection. Scio Township has managed to provide its more urbanized areas with needed services presumably in part because it has a very high property valuation, but stands out among more populous areas for its low tax rates. But Salem Township has no local millage at all (and has already opted out of the countywide transit plan), and Lima, Lyndon, and Sylvan Townships (all in the western part of the county) levy less than a mill, period. (Lyndon and Sylvan have already opted out.) Bridgewater has already opted out; it does have a police protection millage. Mark Ouimet, who represented many of these western townships on the Board of Commissioners and represents them now in the Michigan State House, stated at the December 6 financial task force subcommittee meeting that the “price point” would be “enormously sensitive”, and when asked point-blank whether the millage was likely to pass in those areas, said simply, “No.” Consider: voters in townships that have tax rates of a mill or less would be asked to vote in a millage equivalent to what they have been willing to tax themselves for all municipal services, often doubling their tax rates. Townships in the southeastern part of the county, including Augusta and York, have also long been noted to be tax-averse, often struggling to pass public safety millages. Karen Lovejoy Roe, who represents this area on the u196 board, has been vocal at meetings about the level of service in the TMP provided to this relatively remote area. She has also indicated that a millage is problematic. As an additional complicating factor, the City of Ypsilanti is considering whether their charter transit millage, which is assumed to be part of the 4-party plan, should be reduced or eliminated in the case of a countywide millage. As the report on AnnArbor.com indicates, some members of the Ypsilanti City Council are questioning whether the terms of the millage issue passed last year permit them to transfer the revenue to a new agency. Any ballot question submitted to the voters of the City of Ann Arbor and/or the City of Ypsilanti shall clearly identify the new funding as additional to the existing millage. Hieftje said one of the features he’s most looking forward to is an east-west commuter rail line that will make possible 10-minute trips between Ann Arbor and Ypsilanti. In the interest of forwarding this vision, the mayor has now appointed the man who has been responsible for elaborating the plan, Eli Cooper, to the AATA board. Will the mayor also be able to move his supporters on the Council to approve the 4-party agreement? That is indeed an important political question. This post has been revised to include more information about tax rates. Links to more information about the countywide transit plan and other local transportation issues are on the Transportation Page. UPDATE: Regarding a potential statewide referendum to legalize marijuana on next year’s November ballot, that is no longer a rumor. Here is the account on AnnArbor.com. This entry was posted on December 29, 2011 at 10:00 pm and is filed under civic finance, politics, Transportation. You can subscribe via RSS 2.0 feed to this post's comments. You can comment below, or link to this permanent URL from your own site. Vivienne – those tables with millage rates are very revealing! I knew Ypsi was heavily taxed, but had no idea it was twice as high as Ann Arbor! Ypsi City’s estimated 2009 median income was $31,322, compared with $50,291 for Ann Arbor, according to http://www.city-data.com/. Yet they voted to add more for bus service in 2010…what a testimony to how highly less affluent people value transit. Yes, I think of them (with absolutely no disrespect intended) as “brave little Ypsi”. I was very impressed with their passing the millage and I agree that it is important for our urban area to provide good connections between Ann Arbor and what I regard as our sister city. One thing that helps a little (in a strange way) is that Ypsilanti assessed values are not so high, so they are not paying as individuals quite as much as that millage rate would indicate. But they have some of the same problems as Ann Arbor, with EMU occupying a significant percentage of their real estate and not paying taxes. I am curious about what role the Campus Bus System at U-M will play regardless of the outcome of the County Wide vote. On the one hand it appears that one of the motives behind the millage is to eliminate the Campus System so that AATA will provide bus service for U-M, thus U-M will end up paying an enormous amount of money to AATA. On the other hand, if the vote fails, and with all the consultants that AATA has contracted with, and has paid out what I perceive to be excessive; that the U-M would be politically compelled to bail out the AATA financially. Thus either merge the AATA with the Campus Bus System or just eliminate the Campus System and contract with the AATA to operate the service. Actually, AATA and the UM bus system have a very good relationship and I would expect that to continue. The UM pays a fixed rate so that UM passes are good for travel on AATA, and in return allows the AATA to use its ridership to qualify for Federal operating funds. I don’t understand how you think the UM would be compelled to bail out the AATA; if the AATA did fail for some reason, I’m sure the UM system would manage. I also don’t understand why you think the motive is to eliminate the Campus System. However, the North-South connector would serve (mostly) the UM and would probably supersede many of the campus buses that run from North Campus to the central campus. It would do this at the expense of the entire AATA system, so it appears that non-UM taxpayers will be the ones paying out money for the UM. Thanks Vivienne for the information. My impression or rather my fear was in fact because the Connector study actually mimics the Campus routes, and with AATA operating these routes it basically squeezes out the Campus Bus System. Additionally, the problems cited as justification for this concept (ie traffic along Fuller Road) I feel is terribly exaggerated. The traffic problems are not an all day every day event. This is just one of several reasons that I have the fears that I have with regards to this. My personal feelings are that I would like to see the U-M and the AATA bus systems work closer together and concentrate on improved coordination, perhaps develop the Regional Transit Authority together utilizing both systems. I am curious if this could be accomplished without the direct heavy burden upon the taxpayers. Interestingly enough, with Gov. Snyder’s concept of Regional Transit this area is a fantastic laboratory for this. Interesting ideas. You certainly have a different perspective on this. I’m not sure that Gov. Snyder’s RTA would be the place to find a savior for UM issues. Actually they would probably contract with the AATA or its successor for our local transit, so the plan would proceed much as has been described. So much is uncertain that it is difficult to predict. Vivienne, this issue is becoming quite confusing, the more I follow this issue, the more I find myself becoming confused. Hopefully, you might clear up some of the fog. 1) I was under the impression that the original millage that my parents voted on in 1969 would cease to exist should a “new entity” be formed. Ultimately; is this Regional Transit Authority that AATA wants to morph into considered new, and thus would render the millage null and void? 2) Will the entire millage (3 mills for A2 and 2 for Ypsi) become “permanent” or will portions need renewal by way of voter approval? 3) If #2 above needs partial voter renewal to continue, what will the outcome be if portions are NOT renewed by voters. Yes, it is confusing, especially because there are claims and counterclaims. But your questions are straightforward and there are answers! 1. No, the whole point of the 4-party agreement is that Ann Arbor agrees to deed its existing “perpetual” millage to the New Authority. That is about 2 mills now. In addition, it is generally thought that we will be asked to vote for another millage. 2. The 2 mills for Ann Arbor and 1 mill for Ypsilanti would remain indefinitely. The extra 1 mill that is being discussed would require periodic millage renewal votes. 3. That is the question! What would happen to the authority and to Ann Arbor’s service if the extra millage was not renewed? No one has gone there. In response to Ken’s Question 3: if a transit millage is not renewed, service has to be cut back. This happened in St. Louis MO a couple of years ago. The pro-transit people mounted a more vigorous campaign, and that plus the realization that the cutbacks were (a) real, and (b) painful, led voters to approve the millage next time it was presented to them. Service was then restored to previous levels. Yes, clearly service would be cut back, but what service and where? Tony Derezinski made comments last night (January 23 Ann Arbor City Council meeting) indicating he expected the new authority to be selling bonds. Don’t bondholders have to be paid first? I have been studying the proposed RTA that Governor Snyder wishes to put together, in light of how this is set up; quite honestly I feel this to be a total waste of money and time as well as a total non solution to an RTA. After learning that as of January 4th Detroit Mayor Bing has “outsourced” the Upper Administration of DDOT. (my sources tell me that more than likely the entire Operation of DDOT is likely to be “Privatized” within the coming year). Knowing SMART has suffered terrible financial losses notwithstanding DDOT’s problems. I am certain that SMART will end up losing additional funding in the near future, this I fear may be the end of SMART. I can not help but consider that perhaps the Governor’s concept of an RTA should be re-thought to perhaps merge AATA, DDOT and SMART into one Operating Authority and split into Operating Divisions similar to that of the MTA in New York or adopt the concept of New Jersey Transit model. Before gasping and choking on what I just mentioned!, please consider this; any true RTA must include comprehensive coverage as seamlessly as possible in and through Southeast Michigan. It appears that the time is at hand to seriously consider this concept. In reading the most recent article provided by the Chronicle, I read with interest the short blog that was presented between you and another gentleman with regards to State and Federal funding for the AATA. My understanding was that the new RTA would be the recipient of all Federal and State funding for the 4 counties, thus dispersing the funds proportionately to AATA, DDOT and SMART. Are we confident that this will not be the case? Yes, it is clear that the Metro Detroit public transit system needs to be strengthened and supported. I’m just not sure what part Washtenaw County should play in it. I agree that we need to study very, very carefully how the new RTA would affect our local access to state and Federal formula funds. I hope that is going to be clarified in the next couple of weeks.